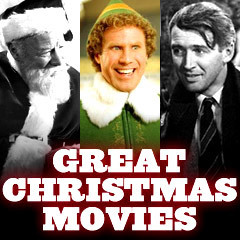 Great Christmas Movies: What are some of the best Christmas (or holiday) movies? The holidays are definitely about mandatory viewing of some of the best theatrically-released films that capture the spirit of the times - a regular pasttime in addition to other December traditions such as lighted trees, holly berries and mistletoe. They tell of good tidings, lessons to be learned about being generous rather than greedy, getting together with family members (oftentimes dysfunctional), showing love and cheer, and consuming great food. There are a number of criteria (arguably subjective) that may be used to classify "Christmas movies": (1) Is the movie set during Christmastime or strongly associated with the festive season? (2) Does the movie touch upon uplifting Christmas themes and elements, such as redemption, charity or fellowship among people, or does it in some way evoke the Christmas spirit of contentment, or bring back family and childhood memories? (3) Does watching the film at Christmastime enhance the enjoyment of the experience? or (4) Is the movie generally accepted as a Christmas movie tradition? It should also be noted that the holiday season hasn't always had the film industry's emphasis on increasing yearly grosses or the release of many Oscar-worthy (or prestige) titles - during what should now be termed the "award season." In the old days, classic Disney animated features were often re-released for the holidays, in addition to light-hearted comedies and musicals. The trend to release large-scale pictures during the holidays began in the mid-1970s, with the release of King Kong (1976), Superman: The Movie (1978), and Star Trek: The Motion Picture (1979). The classic Christmas movies span the years from the 1930s to the 1970s, while the modern-day Christmas movies are from the 1980s to the current decade. A wide range of movies are described, to offer a quick look at what might be great viewing choices - some are well-known titles and some are forgotten and less heralded. Peace and harmony are always promised at this time of year, as seen in George Bailey's rescue from suicide in It's A Wonderful Life (1946), Scrooge's transformation from miserly to generous in A Christmas Carol (1951) (one of many versions), and Bing Crosby's two renditions of "White Christmas" in Holiday Inn (1942) (black and white) and White Christmas (1954) (color). There are some bona-fide traditional classics here, lots of Christmas or holiday-themed films - and some dark comedies (although Gremlins (1984) and Die Hard (1988) - tangential Christmas films - aren't included here). Many have wonderful nostalgic ingredients that make them perfect for viewing. PS: Made-for-TV movies, specials, and animations (such as Rudolph, the Red-Nosed Reindeer (1964), A Charlie Brown Christmas (1965), How the Grinch Stole Christmas! (1966), Frosty the Snowman (1969), and Mickey's Christmas Carol (1983)) are not included.